One group's Arts Festival presence required visas and a mountain of paperwork. More than two decades ago, a business card landed on Lisa Sewell's desk showing what appeared to be a line of boisterously colored ostriches perched on stilts. "I was just really enamored by this card and the image of the six ostriches on the card," Sewell, the executive director of the Utah Arts Festival, says. "I've been sitting on this card probably since the '90s." 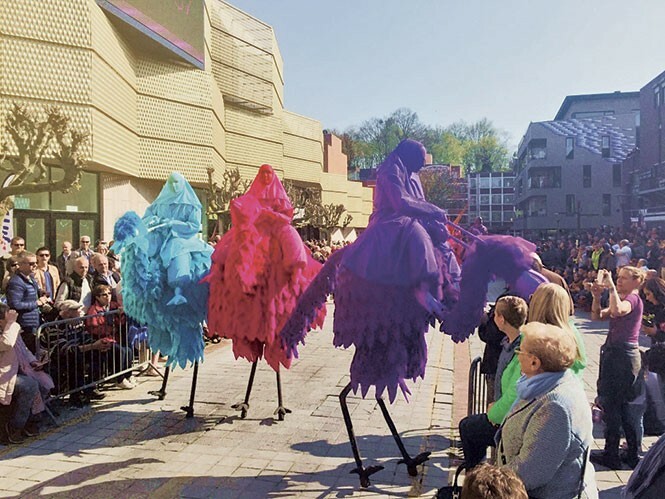 As Sewell cobbled together the Arts Festival over the years, she says she often thought of the card and the words and contact information printed across the back for Neighbourhood Watch Stilts International, a street theater group based in the United Kingdom. Sewell says she contacted the group's artistic director, Paul Miskin, on multiple occasions over the years to arrange a trip to Utah. But due to the group's rigorous touring schedule, a local appearance never worked out. And so it was with some measure of relief that before the 2015 Utah Arts Festival, Sewell made the annual call to Miskin, and a slot was secured for the 2016 festival. But it is at this point that the real work commenced. In addition to securing funding and arranging travel schedules for Neighbourhood Watch, Sewell says she got a crash course in international immigration laws, realizing that she needed to fill out a mountain of paperwork through the U.S. Department of Homeland Security in order to secure the group's visas. Sewell says she began compiling the required documents in late 2015. But the forms couldn't be submitted earlier than six months before the event, so she waited until February. In the meantime, Sewell got a helping hand from Lorina Tester, an immigration attorney who submitted a mask for the Arts Festival's masquerade fundraiser. Once Tester found out about the bureaucratic scrum to secure Neighbourhood Watch's visas, she volunteered her services. Tester says securing visas for performing artists can be difficult because the visa is employment-based. As such, government officials try to ensure that the artists are internationally known and that they won't be siphoning any jobs away from Americans. One of the tricky parts, Tester says, is satisfying a portion of the legal documents that requires one to show that "the group is internationally recognized as outstanding in the discipline for a sustained and substantial period of time as demonstrated by the group's receipt for, or nomination for, significant international awards or prizes for outstanding achievement in the field. ..."
The process, Sewell says, "felt like I was filling out a college application and making sure I was doing it perfect." Once the visas were approved, Sewell says everyone traveling to the U.S. needed to pay a visit to the U.S. Embassy in London. The artists all live several hours away, and Sewell says Miskin arranged a trip to London. Miskin says he and Sewell have exchanged nearly 200 emails over the past two years, and that, by his count, the temporary immigration forms hit 90 pages. "We now have that very prized and strangely appropriate status: 'internationally acclaimed alien,'" Miskin says. In her 21 years with the Arts Festival, Sewell says she has secured visas for foreign performs before, but she usually works with an agent who handles the paperwork. In this case, Neighbourhood Watch is small and doesn't use an agent. Even with the hoops she had to jump through to ensure Neighbourhood Watch's appearance, Sewell says it was well worth it, and it is but one small part of the effort she undertakes in attempting to make the festival seem new each year. "The challenge has always been, 'Now what? Now what are we going to do?'" Sewell says. "We're always working two years in advance, just like with [Neighbourhood Watch]. With regard to growing pains, part of the fun with the festival is that it is new and different every year." Stilts performers from Neighbourhood Watch will be roaming the festival during each of the four days. And so when you notice the ostriches high above the ground, try to remember that their journey to Utah began more than a decade ago, and that of the more than 300 performers at this year's festival, Sewell likely spent more brain power acquiring Neighbourhood Watch than any other. It is also a sort of American premiere for the group, which Miskin says last performed in the U.S. 16 years ago. "I'm super excited to have them," Sewell says. "It's just different. It's a different experience."